The Export tool allows users to download map layers in CSV or Shapefile format. 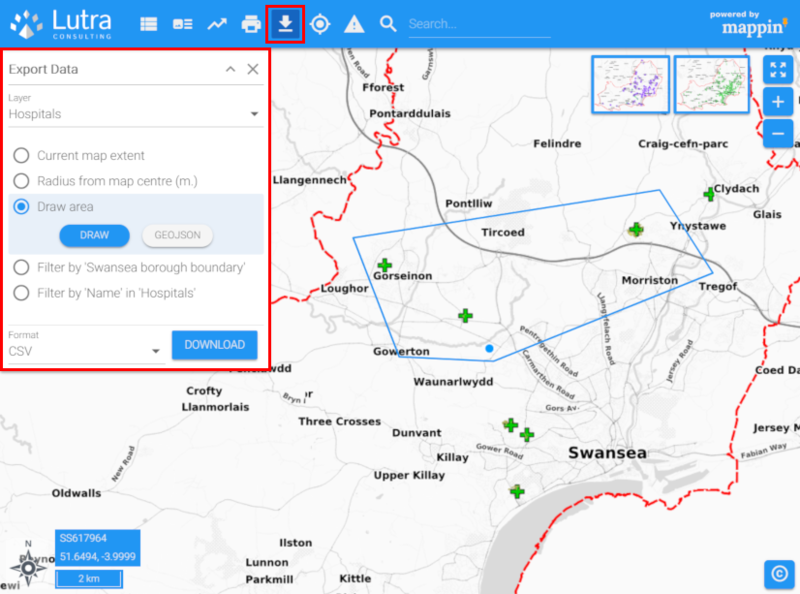 The Export tool also supports filtering exported data based on spatial or attribute filters. In the image above, the user has opted to export data from the Hospitals layer from within a freehand polygon they’ve drawn on the map. The data will be exported as a CSV file. Column headings in exported CSV files respect any attribute aliases (if configured) whereas columns in Shapefiles are the same as in the underlying dataset. 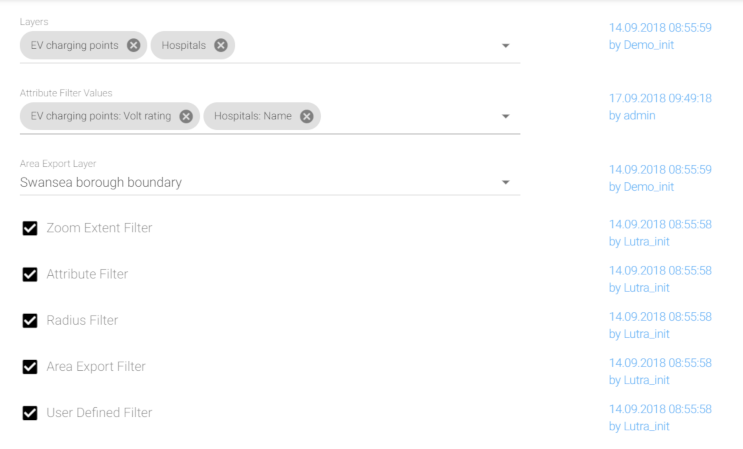 The option allowing the export to be filtered based on intersection with features from another layer can be used to export a subset of a wider dataset by administrative region. 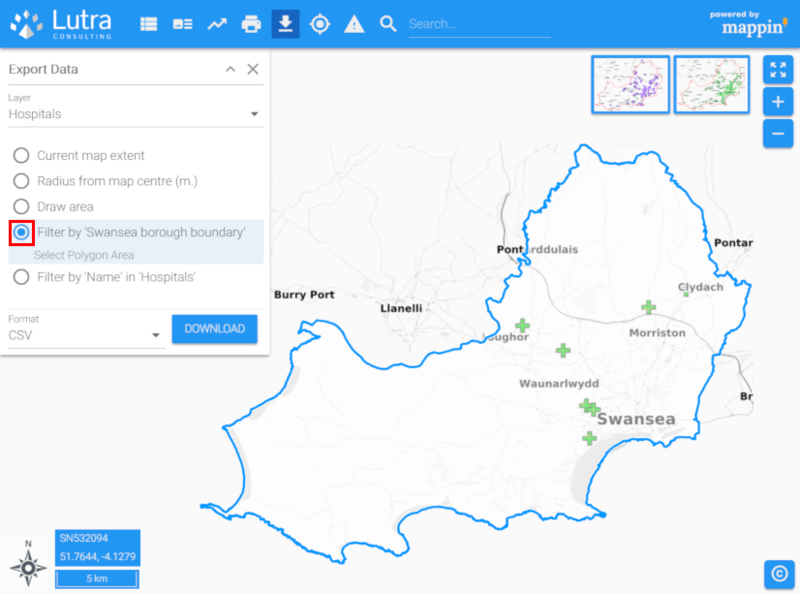 For example, if the user wanted to export all hospitals from a national hospitals dataset, but only wanted those within the Swansea borough, they could use this option and select the Swansea borough from a layer of administrative boundaries during export. 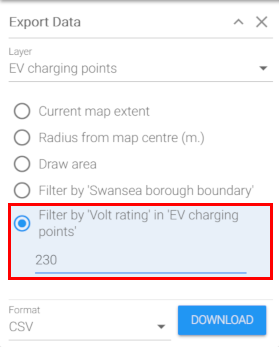 The option for filtering based on attribute could be used to export Electric Vehicle charging points with a rated voltage of 230v. The Export tool has the following settings. The layers users may export using the Export tool. When using the Attribute filter (see below), the attributes on which to allow filtering. When using the Area Export filter (see below), a polygon layer. The user will be able to select a polygon from this layer to filter their exported data by. These options enable / disable the various filter options. © Copyright 2019, Lutra Consulting Limited.